Hair Drug Follicle Testing is one of the most trusted methods of drug testing today and is used by law enforcement officials and organizations alike. It is extremely accurate, providing a drug history for up to 90 days and is proven to be more sensitive than Urine and Saliva testing. 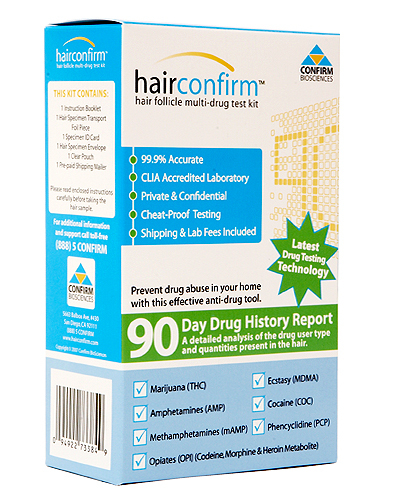 HairConfirm™, the perfect drug testing solution for parents gives you the peace of mind that you can monitor your teen for possible drug use with one simple test every 3 months. The kit comes complete with sample collection and shipping materials, to provide you with the fastest turnaround time in Hair Testing. Each test comes complete with a hair sample collection kit, instructions, pre-paid shipping for easy hair collection in the comfort and privacy of your own home. Need A Professional Legal Hair Drug Test? 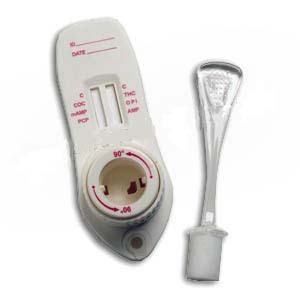 - for professional drug test collection. Requires collector certified in hair drug test collections, see Laboratory Hair Drug Test.